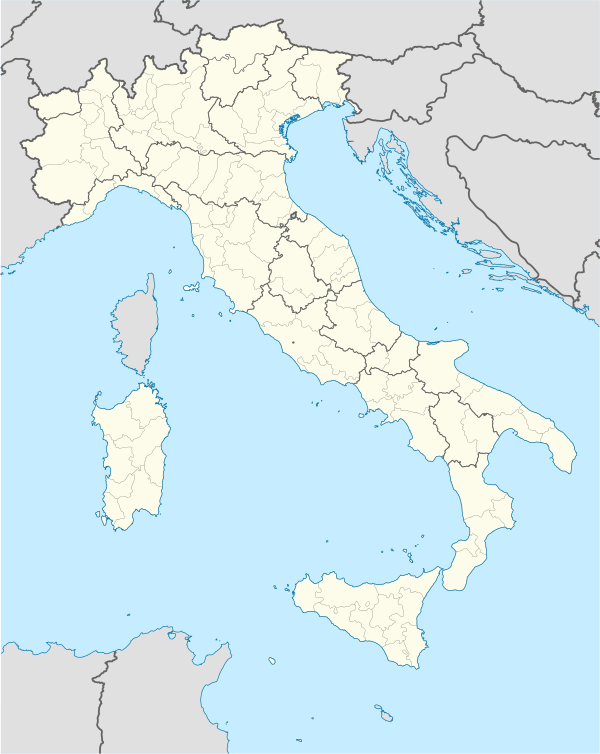 Benevento [beneˈvɛnto] listen (Neapolitan: Beneviento) is a city and comune of Campania, Italy, capital of the province of Benevento, 50 kilometres (31 mi) northeast of Naples. It is situated on a hill 130 metres (427 feet) above sea level at the confluence of the Calore Irpino (or Beneventano) and the Sabato. It is also the seat of a Roman Catholic archbishop. 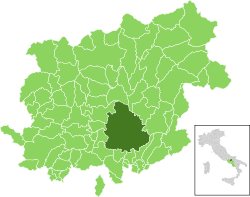 Benevento occupies the site of the ancient Beneventum, originally Maleventum or still earlier Maloenton. The "-vent" portion of the name probably refers to a market-place and is a common element in ancient place names. The Romans theorized that it meant "the site of bad events", from Mal(um) + eventum. 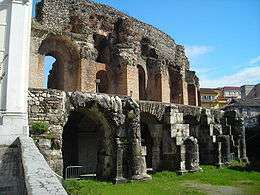 In the imperial period it was supposed to have been founded by Diomedes after the Trojan War. 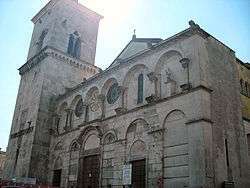 A patron saint of Benevento is Saint Bartholomew, the Apostle, whose relics are kept here at San Bartolomeo Cathedral. 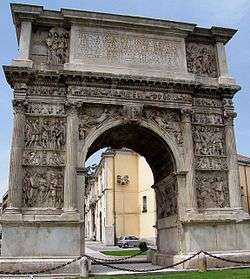 Benevento, as Maleventum, was one of the chief cities of Samnium, situated on the Via Appia at a distance of 51 kilometres (32 mi) east from Capua on the banks of the river Calor (modern Calore). There is some discrepancy as to the people to which it belonged at contact: Pliny expressly assigns it to the Hirpini; but Livy certainly seems to consider it as belonging to the Samnites proper, as distinguished from the Hirpini; and Ptolemy adopts the same view. All ancient writers concur in representing it as a very ancient city; Solinus and Stephanus of Byzantium ascribe its foundation to Diomedes; a legend which appears to have been adopted by the inhabitants, who, in the time of Procopius, pretended to exhibit the tusks of the Calydonian Boar in proof of their descent. Festus, on the contrary (s. v. Ausoniam), related that it was founded by Auson, a son of Ulysses and Circe; a tradition which indicates that it was an ancient Ausonian city, previous to its conquest by the Samnites. But it first appears in history as a Samnite city; and must have already been a place of strength, so that the Romans did not venture to attack it during their first two wars with the Samnites. It appears, however, to have fallen into their hands during the Third Samnite War, though the exact occasion is unknown. 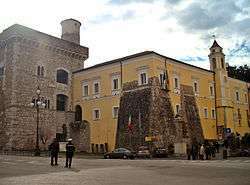 Benevento was certainly in the power of the Romans in 274 BC, when Pyrrhus was defeated in a great battle, fought in its immediate neighborhood, by the consul Curius Dentatus. Six years later (268 BC) they further sought to secure its possession by establishing there a Roman colony with Latin rights. It was at this time that it first assumed the name of Beneventum, having previously been called Maleventum, a name which the Romans regarded as of evil augury, and changed into one of a more fortunate signification. It is probable that the Oscan or Samnite name was Maloeis, or Malieis (Μαλιείς in Ancient Greek), whence the form Maleventum would derive, like Agrigentum from Acragas (modern Agrigento), Selinuntium from Selinus (the ruins of which are at modern Selinunte), etc. As a Roman colony Beneventum seems to have quickly become a flourishing place; and in the Second Punic War was repeatedly occupied by Roman generals as a post of importance, on account of its proximity to Campania, and its strength as a fortress. In its immediate neighborhood were fought two of the most decisive actions of the war: the Battle of Beneventum, (214 BC), in which the Carthaginian general Hanno was defeated by Tiberius Gracchus; the other in 212 BC, when the camp of Hanno, in which he had accumulated a vast quantity of corn and other stores, was stormed and taken by the Roman consul Quintus Fulvius Flaccus. And though its territory was more than once laid waste by the Carthaginians, it was still one of the eighteen Latin colonies which in 209 BCE were at once able and willing to furnish the required quota of men and money for continuing the war. 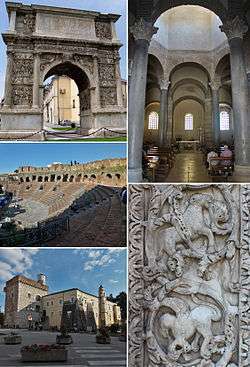 No mention of it occurs during the Social War, although it seems to have escaped from the calamities which at that time befell so many cities of Samnium; towards the close of the Roman Republic Benevento is described as one of the most opulent and flourishing cities of Italy. Under the Second Triumvirate its territory was portioned out by the Triumvirs to their veterans, and subsequently a fresh colony was established there by Augustus, who greatly enlarged its domain by the addition of the territory of Caudium (modern Montesarchio). A third colony was settled there by Nero, at which time it assumed the title of Concordia; hence we find it bearing, in inscriptions of the reign of Septimius Severus, the titles Colonia Julia Augusta Concordia Felix Beneventum. Its importance and flourishing condition under the Roman Empire is sufficiently attested by existing remains and inscriptions; it was at that period unquestionably the chief city of the Hirpini, and probably, next to Capua, the most populous and considerable city of southern Italy. For this prosperity it was doubtless indebted in part to its position on the Via Appia, just at the junction of the two principal arms or branches of that great road, the one called afterwards the Via Trajana, leading thence by Aequum Tuticum into Apulia; the other by Aeclanum to Venusia (modern Venosa) and Tarentum (modern Taranto). Its wealth is also evidenced by the quantity of coins minted by Beneventum. Horace famously notes Beneventum on his journey from Rome to Brundusium (modern Brindisi). It was indebted to the same circumstance for the honor of repeated visits from the emperors of Rome, among which those of Nero, Trajan, and Septimus Severus, are particularly recorded. 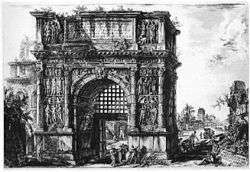 The Arch of Trajan, provided with a portcullis, as it appeared in the 18th century, etching by Piranesi. Some of the bas-reliefs are now in the British Museum. Beneventum indeed seems to have been a place of much literary cultivation; it was the birthplace of Orbilius the grammarian, who long continued to teach in his native city before he removed to Rome, and was honored with a statue by his fellow-townsmen; while existing inscriptions record similar honors paid to another grammarian, Rutilius Aelianus, as well as to orators and poets, apparently only of local celebrity. The territory of Beneventum under the Roman Empire was of very considerable extent. Towards the west it included that of Caudium, with the exception of the town itself; to the north it extended as far as the river Tamarus (modern Tammaro), including the village of Pago Veiano, which, as we learn from an inscription, was anciently called Pagus Veianus; on the northeast it comprised the town of Aequum Tuticum (modern Sant'Eleuterio, near Castelfranco in Miscano), and on the east and south bordered on the territories of Aeclanum and Abellinum. An inscription has preserved to us the names of several of the pagi or villages dependent upon Beneventum, but their sites cannot be identified. 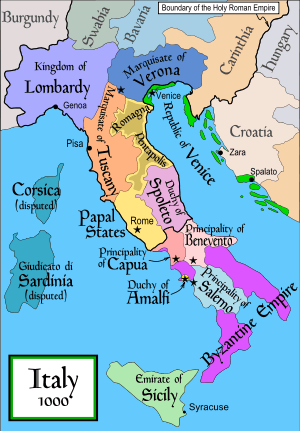 In the following decades, Benevento conquered some territories to the Roman-Byzantine duchy, but the main enemies was now the northern Lombard reign itself. King Liutprand intervened in several times imposing a candidate of his own to the duchy's succession; his successor Ratchis declared the duchies of Spoleto and Benevento foreign countries where it was forbidden to travel without a royal permission. Papal Benevento in the 18th century. Benevento passed to the Papacy peacefully when the emperor Henry III ceded it to Leo IX, in exchange for the Bishopric of Bamberg (1053). Landulf II, Archbishop of Benevento, promoted reform, but also allied with the Normans. He was deposed for two years. Benevento was the cornerstone of the Papacy's temporal powers in southern Italy. The Papacy ruled it by appointed rectors, seated in a palace, and the principality continued to be a papal possession until 1806, when Napoleon granted it to his minister Talleyrand with the title of Sovereign Prince. Talleyrand was never to settle down and actually rule his new principality; in 1815 Benevento was returned to the papacy. It was united with Italy in 1860. 1 2 3 4 5 6 7 One or more of the preceding sentences incorporates text from a publication now in the public domain: Chisholm, Hugh, ed. (1911). "Benevento". Encyclopædia Britannica. 3 (11th ed.). Cambridge University Press. pp. 727–728. ↑ Pliny iii. 11. s. 16; Livy xxii. 13; Ptolemy iii. 1. § 67. ↑ Gaius Julius Solinus 2. § 10; Steph. B. s. v.; Procop. B. G. i. 15. ↑ Plutarch Pyrrh. 25; Frontinus Strategemata iv. 1. § 14. ↑ Livy Epit. xv. ; Velleius Paterculus i. 14. ↑ Pliny iii. 11. s. 16; Liv. ix. 27; Fest. s. v. Beneventum, p. 34; Steph. B. s. v.; Procop. B. G. i. 15. ↑ James Millingen, Numnismatique de l'Italie, p. 223. ↑ Liv. xxii. 13, xxiv. 14, 16, xxv. 13, 14, 15, 17; Appian, Annib. 36, 37. ↑ Appian, B.C. iv. 3; Strabo v. p. 250; Cicero In Verrem i. 1. 5. ↑ Appian. l. c.; Lib. Colon. pp. 231, 232; Inscr. ap. Romanelli, vol. ii. pp. 382, 384; Orell. Inscr. 128, 590. ↑ Strabo vi. p. 283. ↑ Sat. i. 5, 71. ↑ Tacitus Ann. xv. 34. ↑ Pliny iii. 11. s. 16; Mommsen, Topogr. degli Irpini, p. 167, in Bull. dell'Inst. Arch. 1847. ↑ Procop. B. G. iii. 6; P. Diac. ii. 20; De Vita, Antiq. Benev. pp. 271, 286. ↑ Suet. Gram. 9; Orell. Inscr. 1178, 1185. ↑ Henzen, Tab. Aliment. Baebian, p. 93-108; Mommsen, Topogr. degli Irpini, p. 168-71. ↑ Millingen, Numismatique de l'Anc. Italie, p. 223; Friedländer, Osk. Münz. p. 67; McClure, British Place-Names etc., p. 33. ↑ Bonfil, Robert (2009). History and Folklore in a Medieval Jewish Chronicle. Leiden: Brill. p. 74. ISBN 978-90-04-17385-9. ↑ Patai, Jennifer (1989). The Myth of the Jewish Race. Detroit: Wayne State University Press. p. 44. ISBN 0-8143-1948-3.
von Falkenhausen, Vera (1983). "I Longobardi meridionali". In Giuseppe Galasso ed. Il Mezzogiorno dai Bizantini a Federico II. Turin: UTET. pp. 251–364.